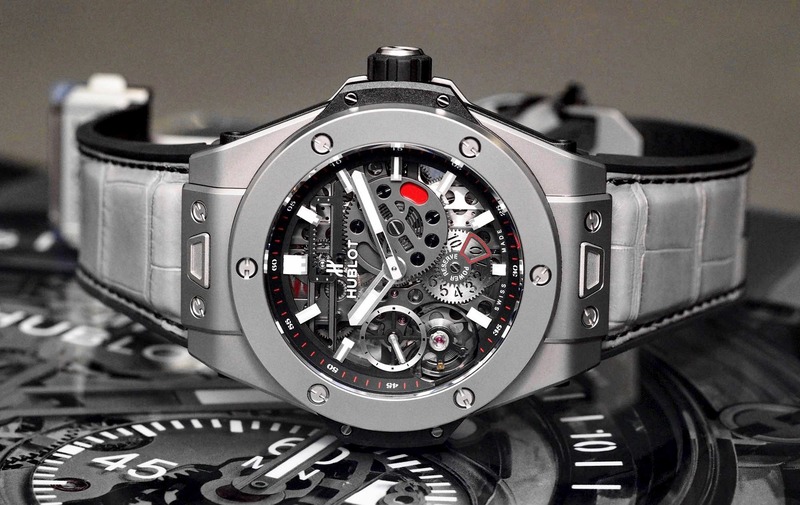 Hublot’s Big Bang Meca-10 features a skeletonized manufacture movement in a large case measuring 45 mm x 57 mm x 15.8 mm. The collection currently consists of versions made in titanium, King Gold, Full Magic gold, or ceramic, all of which have a black composite resin lower bezel and case flanks. Driving the hours, minutes, small seconds, and dual power reserve indicators are Hublot’s 3Hz caliber HUB1201, which is made in-house and features a massive 10-day power reserve that needs to be wound by hand. For this article, we photographed the Big Bang Meca-10 Titanium (Ref. 414.NI.1123.RX) and the Meca-10 Full Magic Gold (Ref. 414.MX.1138.RX). The titanium version is lighter on the wrist, and on the pocket but the proprietary gold model has some unique elements that make a compelling argument in favor of a precious metal, even if you’re the type who always prefers steel or titanium. Full Magic Gold is marked as 18K gold but unlike others alloyed golds, which are typically 75% pure gold mixed with 25% of other alloys such as platinum, nickel, copper – Magic Gold’s 25% is made of ceramic boron carbide powder. The result: a scratch-resistant gold that is both certified as 18K by the Central Office for Precious Metals Control, and has a hardness rating of about 1,000 Vickers. For comparison, typically 18k gold of any color is 400 Vickers and most steel used in watches is 600 Vickers. Magic Gold is completely scratchproof, and it can only be scratched by a diamond. Raw Magic Gold is yet to be machined and, because it is so hard, it can only be shaped by diamond-tipped tools, laser, and ultrasonic machining. In fact, to place the “18K” hallmark on the caseback, it must be done with a laser etching machine as traditional methods do not work. One of the other key, and rarely mentioned, selling points of Magic Gold, is that it is extremely light for 18K gold. At 138 grams it weighs significantly less than a gold case of this size would normally be. Part of this is due to that fact that the bezel and case flanks are made from a lightweight resin material, and because the inner case is titanium, but still, it’s insanely light for 18K gold. 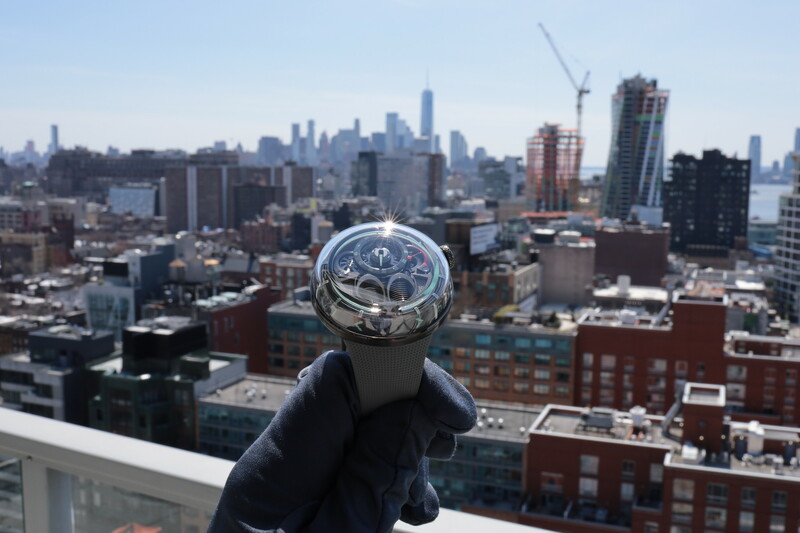 The titanium version is only 14 grams lighter at 124 grams. For reference, a King Gold case, which does not have any ceramic mixed in, weighs a little over 170 grams. 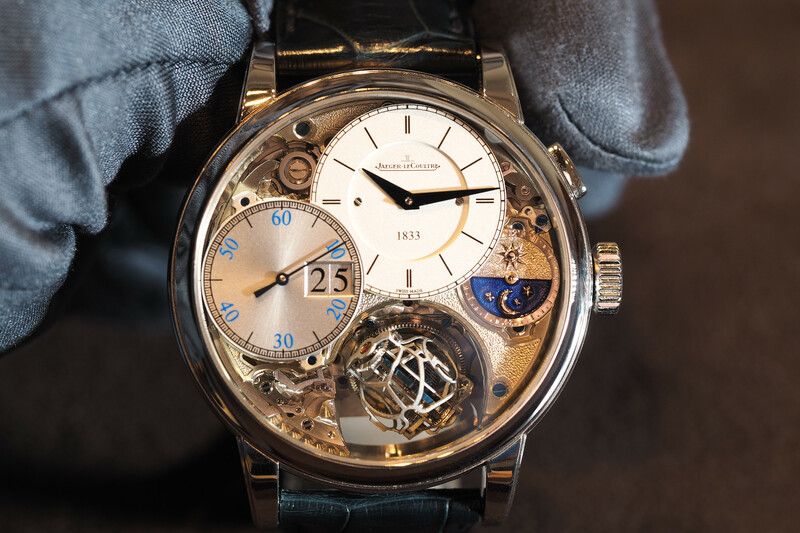 Normally the difference between gold (one of the heaviest watch case materials) and titanium (one of the lightest watch case materials) is far greater. Additionally, Magic Gold has one more unique element: the surface has a sort of worn look that makes it appear almost like bronze, but without a chance of changing is color or forming a green patina. Of course, if you like the look of titanium and want the lighter case, then that is a better option and will save you close to $15K. The entire case has been micro-blasted with beads resulting in a finish. Uniquely, both watches feature two power reserve indications, allowing you to monitor the power reserve remaining by day (10 days), or view the warning indicator at 3 o’clock which turns red when there are only 2 days of power reserve remaining. Another interesting feature is a rack and pinion system visible at 12 o’clock and which is animated when you wind the twin parallel mainspring barrels, which have a 240-hour maximum power reserve. There are a variety of straps to choose from, and you basically have to use specific Hublot straps. The upside is that each strap uses a quick-release system where you simply push a button and pop the strap off, which is excellent. In conclusion, if you like the Meca-10 look, and can afford it, you have many good options, and even if the titanium or Magic Gold is not to your liking there are also all ceramic versions, blacked out titanium, and King Gold. That said, the titanium has a really great look and the lowest price of all of them. Although, if you want gold, without the scratches or the weight, and the really cool bronze-ish look, then the Magic Gold is really an excellent choice. 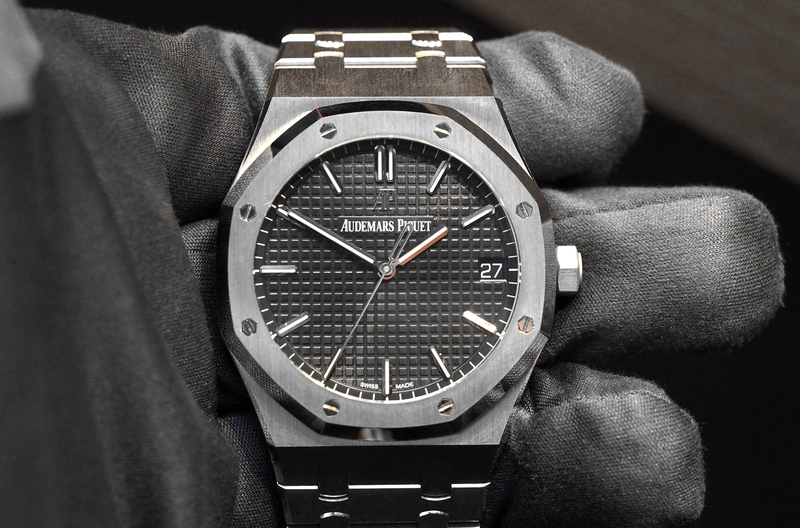 Hublot has not sold this alloy to anyone yet, but there is demand from other companies, and they intend to make it in other precious metals as well, perhaps platinum. The retail price in titanium is $19,900 and $34,600 in gold. Next articleCartierMatthew Macfadyen wears fake watch in HBO's "Succession"?